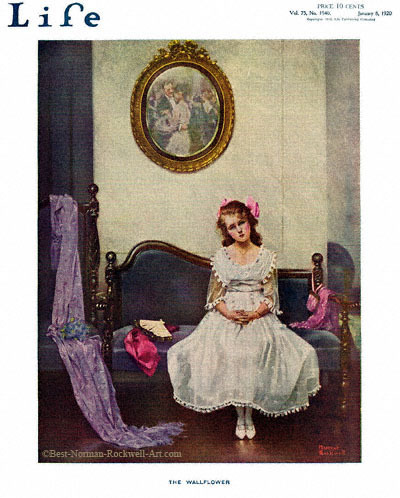 The Wallflower, this Norman Rockwell painting, appeared on the cover of Life Magazine published January 8, 1920. This painting was Rockwell's seventeenth overall picture featured on the cover of Life Magazine and the first Rockwell cover in 1920. Life magazine featured a Rockwell illustration on its cover a total of twenty-eight times between 1917 and 1924, with six covers appearing in 1920. In this painting, Norman Rockwell shows us another trying moment from adolescence. That moment occurs when a young girl or boy is attending a dance or party. This dreaded moment is when a shy person is left all alone while everyone else at the party is socializing or dancing. This particular moment occurs at a dance. The careful observer can spot couples dancing by looking at the mirror hanging on the wall. This is a real shame. She looks like a pretty girl. This question begs to be asked, though: Is she melancholy because she isn't dancing or is she not dancing because she is melancholy? Did she lose her sweetheart during World War One? Has she found another to take his place in her life? Was he the love of her life and no one else will do? Well, at least she is trying by going to the party. Maybe some gentleman will take a chance at trying to break her melancholy.